No matter what your home's style is, you can rest assured that there is a stone kitchen backsplash out there to complement it. From polished stone mosaics to rustic slate and travertine, the kitchen backsplash is the perfect showcase for stone. There is a lot of controversy about using stone inside the home. All stone, from granite to slate, requires special care and maintenance to keep it looking great. While Europeans have accepted the fact that stone patinas and changes over time, most Americans have a hard time grasping the concept that their marble will stain, age and dull. For anyone who loves the look of stone, but doesn't want to deal with the maintenance or cannot accept the fact that stone will age with time, the kitchen backsplash is the perfect place to display it. Backsplash tiles once served a functional purpose in the kitchen; to keep moisture, grease and stains off of walls where they could do damage. Today's paint, plaster and cleaning supplies have made this purpose obsolete; you can clean up a bare wall just as easily as you can clean up some tile. Because of this, backsplashes evolved over time into a decorative element in the design of a kitchen. Any manner of tile or material can be used in this area, from stone to metal in any size, shape or color. The reason stone does so well as a kitchen backsplash, but not necessarily in other areas of the home, is the lower maintenance required. All stone tiles are sealed during installation, prior to grouting. This sealer penetrates the tiles, fills them and keeps stains from sinking in. While all stone tiles are sealed, tiles used in wet areas, or in heavy traffic areas, such as entry ways are subjected to elements that break this seal down quickly. The result is a tile that needs to be constantly re-sealed and treated. The kitchen backsplash sees no foot traffic and no constant barrage of water and soap. Yes, splatters from the cooktop or a mixer may occur, but simply wiping these drips up with a wet sponge and a neutral PH cleanser such as Dawn or Ivory liquid will take care of them. Stone tiles on a backsplash rarely need to be resealed, and rarely permanently discolor or stain. A stone kitchen backsplash can enhance any kitchen design. Stone tiles have a unique variation, texture and color that cannot be found in other materials. Stone comes in a verity of sizes, ranging from 3/8-inch mosaics up to 18-inch tiles, with finishes ranging from polished to rustic. Stone tiles can be combined with other materials, such as ceramic or glass to give additional depth and style to a kitchen. In fact, one way to ensure a low maintenance stone backsplash is to use ceramic tiles behind the cooktop, and surround them with stone throughout the rest of the kitchen. If you'd like to create a stone backsplash, but don't know where to begin, use one of these ideas as a jumping off point for the kitchen of your dreams. Polished marble mosaics are the perfect material for modern kitchen designs. Look for unique colors, such as Alba Chiaro, Green Fantasia or Honey Onyx. 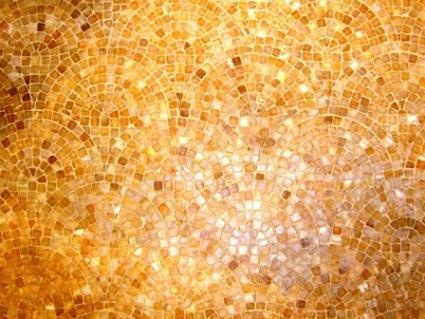 Light hits mosaic tiles differently than large tiles, reflecting off of each one individually. This will create a sparkling effect that is sure to draw attention. Unique stones with lots of variation will ensure that you have a color palette perfect for pulling wall colors, towel colors and wall art from. While tumbled marble backsplashes were extremely popular in the last decade, those 4-inch square tiles have become so ubiquitous as to be hardly worth using. Mix it up by using tumbled marble tiles in different shapes, such as a subway tile pattern.Run the tiles along the counter in a running bond, or offset pattern. When you get to the area behind the cooktop, switch the pattern to a herringbone and frame the area with a chairrail of the same material. You'll get the same, rich look of tumbled marble but with additional, subtle interest and detail. Stone tiles come in a rich assortment of colors. Blues, greens, reds, golds and yellows are all available for use in your kitchen. Make a statement by choosing a number of tile colors in one finish, such as Ming Green, Blue Celeste and Verde Serpe in tumbled marble, and then mix them up in a random design. Purchase the same tiles in polished, 1-inch mosaics for behind the cooktop for a striking contrast that draws the light and the eye together. A stone kitchen backsplash is sure to become a focal point in any home. Use marble, slate or granite to create the backsplash you've always been dreaming of and make your kitchen design show-stoppingly beautiful.